Several things about the holiday season bring out the best in all of us. This time of year, we enjoy the familiar sound of the Salvation Army’s bell-ringers. Food banks and homeless shelters see a rush of volunteers, and clothing donations hit a high point during Thanksgiving and Christmas seasons. It occurs almost without prompting. There is just something about a “season of giving” that brings it out of us. Giving of yourself — your time, money or other resources — is commonplace during this time. What if that feeling lasted all year long? It’s great that we do it in December. But what if we did it year-round? There is a group of people in your community that does just that throughout the year. What they do is not tied to a season. It’s written into their DNA. Principles don’t mean much unless they’re put into action. Cooperatives across the nation and in our own state do that every day. A great example of showing concern for your community is Withlacoochee River Electric Cooperative. In 2007, the Florida co-op took over the economically depressed area of Lacoochee. Some parts of the rural community even lacked indoor plumbing. The investor-owned electric system was decrepit. Today, new Habitat for Humanity homes are rising, dirt roads are paved, the electric grid is dependable and a 16,000-square-foot community center houses a gym, health clinic and computer center. It took a mix of private and public funding and a host of volunteers, but Lacoochee’s turnaround didn’t happen until the employees and member-owners of Withlacoochee River Electric Cooperative put their principles to work in improving the lives of the people in the community. Perhaps not as dramatically, but this happens every day throughout Tennessee. Electric cooperatives take action in their communities by sponsoring Relay for Life teams, building Habitat for Humanity homes and providing volunteers and funds for social-service organizations. It’s not profit-driven — it’s just what we do. Powering our communities means so much more than keeping the lights on. It’s not limited to what your cooperative does for you. Each of us can donate our time and talents to help others in our community. Many of you already participate through “round-up” programs at your cooperatives. These foundations have provided millions of dollars to those in need across our service areas. It’s not difficult to take the next step. Here’s a challenge for you: Don’t volunteer for the food bank only in December. Do it in the spring or summer, too. Don’t just drop off clothing for a year-end tax break. Do it in the fall when needy children go back to school. Concern for community: Make it an everyday thing. Few issues seem more polarizing than climate change and renewable energy — even when trying to reach a level of mutual satisfaction. A point I’ve tried to make over the past few months is that you can’t effect change overnight. What I’ve discovered is that readers often interpret my comments through the prism of their own beliefs. I’m not being critical; that tends to occur when we’re passionate about an issue. Some co-op members aren’t pleased when we voice support for coal-fired generation. One particular reader classified it as unrealistically clinging to the past. Some members aren’t pleased about our support for solar and wind power when we have abundant gas, oil and coal resources in the U.S.
Our position is not about mandating a particular power source but a call for diversity and stability. We don’t hate coal; we don’t want to wreck the environment. Our mission, quite simply, is to keep the lights on. And to do so safely and efficiently. We make economic-based decisions grounded in reality, not partisanship. Over the years, we’ve had disagreements on energy policy with both sides of the aisle. Principled disagreement doesn’t equate with personal dislike or political opposition. Some policy shifts are minimally disruptive. But when policy shifts dictate changing energy sources, it’s going to take a long time and a lot of money. And it’s not going to be happen overnight. For example, it can take more than a mile for a fast-moving supertanker to stop and turn around. It’s a matter of physics, not desire. If we were to immediately shut down all of the coal plants in the U.S., it would make a negligible change in worldwide carbon dioxide levels. We’d also be in the dark. Yet, over the past several years, older coal plants have been shuttered. Huge financial investments have been made to scrub the emissions of those remaining. Investments have been made in renewable energy sources where and when it was economically wise. Our power supplier, the Tennessee Valley Authority, has moved from having coal represent a majority of its generation to a long-term goal of a mix that is 40 percent nuclear, 20 percent coal, 20 percent natural gas and 20 percent hydropower and renewable sources. An “all-of-the-above” energy policy isn’t just a slogan. It’s not “code” that means we don’t support renewable energy. Each power source has benefits and drawbacks. Fuel costs vary. Some sources are readily available; some are not. Any type of generation depends on transmission lines to carry the electricity from the source to your local power company. Just planning and building those lines can take years to accomplish. The sun is free, but solar power isn’t. Wind power is a great option, but the wind does not blow in all the right places at all the right times. Nuclear power is dependable and a steady, long-term power source. It also creates long-term waste problems. Coal is a plentiful and cheap power source. Yet, as we’ve seen in the Valley, it isn’t easy to dispose of coal ash, and we have yet to master the handling of carbon dioxide. Hydropower is inexpensive, clean and totally dependent on the weather. Natural gas burns cleaner than coal, but when overused, supplies dwindle and prices increase. As we’ve seen this past winter, there are times when all are needed. Take your pick about which of those sources you dislike. But, if you remove it from the mix, do you have a workable plan to replace it? Changing policy is easy; making the changes required by that policy is not. As frustrating as the pace of change is for some, a change of pace on this level takes time and care. I really missed the mark in my February column. While writing in early January that “little evidence is left of the record cold weather,” I had no doubt that winter’s cold wouldn’t last much longer. No one anticipated the Tennessee Valley Authority would set five of its top 10 record peak demands in the first few weeks of the year. Unfortunately, I was half-right: High bills continue to strain budgets throughout the region. On those five coldest days, TVA and the local power companies generated and delivered 3,399 gigawatt-hours. Without delving into the math again (see inset), that’s enough energy to power Nashville for 10 months. Everything didn’t work to perfection, but the power stayed on. It’s quite an accomplishment to achieve once, but to meet the demand again and again is remarkable. And you don’t achieve the remarkable by accident. When you lead — whether it’s troops into battle, hikers on an outdoors excursion or utility employees keeping the current flowing — you need a certain amount of technical expertise. Good leadership also knows a thing or two about failure. It’s good to learn early what doesn’t work. Some ideas that look great on paper just don’t turn out so well. For example, in the early 1990s, many of us in the electric utility industry were certain that fuel cells would eventually allow us to serve remote loads efficiently and inexpensively. The technology was “just a few years away.” A couple of decades later, it’s still just a few years away. That’s just a small example of how “experts” can miss the mark. With new technologies, it becomes even more challenging. Longtime utility workers may not know that wind turbines can’t operate below certain temperatures or in extremely high wind speeds. There simply aren’t any simple answers. The steady hands at the helm of our utilities have years of seasoned experience. If there were an easier, less-expensive way to do what we do, that’s how we would be doing it. For our nation to have a workable energy policy, we need experts with true subject-matter knowledge and a few battle scars. What we don’t need is policy designed by people who don’t know what it takes to keep the lights on. It seems the political leaders driving our nation’s energy policy are following that path. Many simply don’t know enough about our industry to be discussing energy policy — much less drafting it. In the utility industry, we have our share of “known knowns” and “known unknowns.” We’ve learned to work through those. But building the next century’s energy policy with “unknown unknowns?” Designing the electricity grid that powers our lives shouldn’t be a training ground. To lean more and become part of the conversation focused on a sensible, balanced approach to the Environmental Protection Agency’s planned new rules for power plants, go to takeactionTN.com. The ice has melted, and burst water lines are repaired. Little evidence is left of the record cold weather — other than high heating bills. As painful as the financial impact is, the alternative could have been much more uncomfortable. The extreme temperatures pushed the Tennessee Valley Authority to a new record demand as we all tried to stay warm. With heating systems running nonstop, lines and substations were pushed to their limits. In a few instances, the strain caused temporary outages. Occasionally, experts make harsh assessments about the condition of our electric grid. The fact is, TVA, a very reliable generation and transmission network, successfully handled this challenge. As the polar vortex moved in on Monday, Jan. 6, consumers in the Tennessee Valley used 683 gigawatt-hours of electricity. The next day was even colder with an average temperature of 4 degrees. TVA reached a peak demand that day of 32,490 megawatts, its second-highest all-time peak. By the end of the day, we set a new use record — 703 gigawatt-hours. A big number but exactly how much electricity is that? The average home uses about 1,200 kilowatt hours each month. In just 24 hours, we used 703,000,000 kilowatt hours. That’s enough electricity to power almost 50,000 homes for an entire year. That is a lot of power. Where did TVA get the energy? 13 percent purchased off the competitive power market — and not at bargain-basement prices. Under normal operations, TVA generates power as cheaply as possible. During periods of high demand, TVA generates or purchases power based on need — not efficiency, not economics. There are a number of responsibilities of an electric utility, and keeping the power on is pretty high on the list, especially during life-threatening temperature extremes. How close did we come? When major utilities near their limits of capacity, they’re required to notify the North American Energy Reliability Council (NERC). Nine utilities, including TVA, contacted NERC and declared that they were in an Energy Emergency Alert 2, which is the last step before they run out of energy. The area impacted reached from Texas to Florida to New York. Only South Carolina ultimately had to resort to rolling blackouts. What lessons are to be learned? First and foremost is this: It is critically important that we have every available weapon in our arsenal. If you remove coal completely from the energy portfolio, the outcome above is quite different. That’s not a theory; it’s simple math. Every energy source has benefits, limitations and drawbacks. Second is that utilities are powered by dedicated people. When temperatures finally crested the freezing mark, dispatchers, linemen and plant operators breathed sighs of relief. Some were able to see their families for the first time in several days. But the ultimate praise is that millions of Tennesseans avoided having to experience outages. Third, the vortex became a stark reminder of what we’ve said for years: By removing coal from the mix, the Environmental Protection Agency (EPA) is doing the opposite of what is needed. Extremes emphasize the need for an all-of-the-above approach to generating electricity from nuclear, coal, natural gas, fuel oil and renewables. We don’t know when the next polar vortex might arrive. Whenever it does, we’ll be prepared. But an unnecessary, manmade power vortex — created by the EPA — could leave us all in the cold. When you ask boxing historians to rank the hardest punchers of all time, Rocky Marciano is usually near the top. One reason: the power in his right hand. A contemporary said getting hit by Marciano was like being hit by a truck. Until the 13th round, Marciano had yet to take full advantage of the power from that right hand. The unleashed power was there, yet it was just potentially dangerous. We all know a person (or two) whom we describe as “having a lot of potential.” It’s not a comment you want to hear about yourself, especially from a teacher or supervisor. It’s a backhanded way of letting you know that you are wasting the potential you possess. Tennessee’s electric cooperatives possess a lot of power. We use that power in a variety of arenas: economically, politically, charitably and, of course, the electricity that powers our communities. We could just string up the wires and provide power, but we would be wasting a tremendous potential to do better things. Your expectations of us —and our expectations of ourselves — go far beyond. Turning the lights on was one accomplishment. Yet today, businesses depend on that power to be on all the time — blinks and momentary outages mean costly shutdowns to many. The nation’s economy has yet to gain a sure footing. We are more fortunate than many states, but the impact of a slow economy and high unemployment hits rural areas hard. Our cooperatives work closely with the Tennessee Valley Authority and state and federal governments to invest in rural economic development. By providing manpower and resources, we’re able to recruit new industry into our communities and help maintain and grow existing businesses. New environmental regulations could dramatically increase the cost of electricity. It’s important to us all; higher costs impact the struggling economy and your day-to-day lifestyle. We try to ensure that environmental goals don’t sacrifice affordability for the sake of politics. We can do both, keeping rates reasonable and achieving cleaner standards. We use our political power not to gain an unfair advantage but to ensure that rural areas aren’t shuffled to the end of the line as energy policy is developed. As you travel about during the holidays, you’re likely to see a lot of lights strung around town squares. It’s just as likely that a co-op truck and lineman put them there. From lighting baseball fields to changing street lights to being part of the local Rotary, our co-ops are good corporate citizens, giving generously to charitable organizations in their communities. Outside of corporate giving, cooperative employees donate their personal time and money to the community. It’s important to note this spirit of cooperation really begins with you. The co-op starts with the membership. Our concern for community is nothing more than an extension of the members’ concern for one another that started this whole operation. It’s grown from one light to cover a nation. That’s a lot of potential. Rocky Marciano not only had tremendous power in his punch, he had an endurance that kept him in the ring, punishing his opponents. His tenacity propelled him to achieve an unparalleled 43 knockouts during his 49-0 career. We’d like to think that we have that same staying power. With your help — your cooperation — we can harness that power to continue meeting the needs of our communities. Let’s not waste the power of that potential. Choices. Not quite as American as apple pie, but pretty close. Given the foundations and the relative wealth of our nation, we’re accustomed to having lots of choices in just about everything we do. We like to have choices, whether it’s selecting a movie to watch, buying a car, or deciding on chocolate, vanilla, strawberry or one of the 28 other flavors. Other choices are more complex and have long-lasting consequences. One of our most complicated choices involves producing enough energy and getting that energy into your home. This continuous process involves thousands of co-op member- owners and employees across the nation every single day. The Tennessee Valley Authority generates the electricity we deliver, and its task is as challenging as ours. Some decisions in the past may have knocked TVA from its perch as the lowest-cost provider, but TVA has a long history of providing dependable, low-cost power to Tennesseans. Generating and delivering electricity to your home involves a lot of difficult choices — a difficult-to-achieve balance of providing enough energy and doing so with a limited impact on the environment. It takes a balance of engineering, design and operational efficiency against environmental and safety concerns. Add cost-effectiveness to that list, and you’ve set some tough goals. Sometimes, we don’t get to choose. There have been countless attempts to craft energy policy at the federal level. Past efforts would have punished the Southeast for our geography. The wind and sun don’t create as much energy in our region as they do in the West and Midwest. And they never will. Tax credits and financial incentives can’t make the wind blow or the sun shine. To put it succinctly, we don’t need — or want — Washington policymakers making decisions on how we generate our electricity. Political machinations are a poor substitute for meticulous planning and analysis. Even worse, the choices made by outsiders are ours to live with for decades. Effective energy policy should be about providing choices. Different solutions work better for different parts of the country. One example: TVA and the Department of Energy recently entered into a partnership developing small modular nuclear reactors (SMRs). Together with Babcock & Wilcox, this cooperative effort could lead to a new generation of lower-cost, clean generation capacity. TVA has been evaluating small nuclear reactors for several years. The Clinch River site, which TVA had once slated for a much larger, costlier facility, is where the SMR project will be located. This type of project is among those needed for a balanced energy future. Energy policy shouldn’t be about picking winners and losers; it should be focused on providing you with an affordable, reliable supply of electricity. The nation’s electric utilities will need a variety of energy sources, from solar arrays to SMRs, to meet those needs. We can achieve our energy goals; we just need the freedom to make the right choices. Always looking to expand my mind, I recently purchased an educational text on electricity. It is written on a level that takes this technically complex product and puts it on a down-to-earth level. The authors, both university professors, do a great job of explaining this innovative product and the ways it impacts people’s everyday lives. 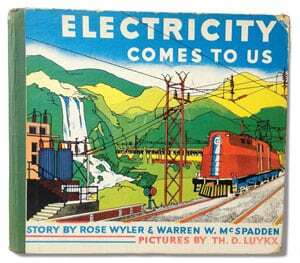 The book, “Electricity Comes to Us,” was published in 1937. Reading it today is a lot like opening a time capsule and trying to imagine what life was like in that era. The section of the book that explains how electricity travels from the generating station (hydroelectric or coal) to homes is titled “The City Power Lines.” Not only was electricity carried into the city at 550 volts, it wasn’t carried into rural areas at any voltage. Today, even the most remote part of Tennessee is likely to have nearby distribution lines that carry electricity at 7,200 volts or greater. The advances in the distribution of electricity made me ponder the book as a time capsule. What went through the minds of the authors when they described how electricity was used? There is a drawing of an electric toaster in the book that was innovative and futuristic then but would be terribly unsafe in any home today. “How didn’t you use electricity 40 years ago? You didn’t use it to charge a mobile phone or an iPhone. You might have used it when you switched on your record turntable to play music from a 12-inch, black, vinyl disk. You most likely didn’t use it to power a computer. And even if you did have one of those garage-sized machines, there was no Internet to connect it to hundreds of millions of people, libraries and businesses all over the world. Today, electric cars, solar and wind energy and efficiency practices are turning from novelties into more commonplace power practices. In 1973 these energy options were so expensive they seemed like science fiction. The list goes on: TV remote controls, microwave ovens, flat-screen TVs, GPS, hospital MRIs. The authors of “Electricity Comes to Us” could not have possibly fathomed the many ways we generate and use electricity today. I don’t know that anyone could have done so. Given the advances that have transpired since 1937, I don’t know that our predictions for 2053 would be any better. It’s difficult enough to maintain today’s electric grid. And the rapidity with which technology advances, it’s difficult and expensive to plan for the future. However, the goal today is the same as it was in 1937: to bring electricity to the homes of the user. No matter how you’ll use electricity in 2053, we’ll be here to bring it to you. When we talk about our community, we’re usually referring to a town or neighborhood. The nation’s electric cooperatives have a somewhat different perspective on community. Our community is local yet it extends hundreds of miles away. A good illustration of that concept involves a Virginia co-op aptly named Community Electric Cooperative. Tennessee line crews have worked there following two recent storms, providing emergency assistance. Community EC also sent crews north to aid with power restoration efforts in areas devastated by Hurricane Sandy. Those linemen, who had already worked several days maintaining and restoring electric service at their own co-op, packed their bags, loaded their trucks and headed north into New Jersey and New York. Tennessee’s electric cooperatives have adopted “Community” as our theme for 2013. For us, it’s more than just a slogan. Our roots in the community go back to the farmhouses and meeting places where we were formed. Today, those community beginnings remain woven into the fabric of everything we do, and our electric cooperatives live out that commitment to our members every day. The work we do is for the benefit of the members we serve — not for shareholders, investors or faraway owners. From the time the first lines were strung in our communities until today, it’s been a never-ending commitment. In the early days, keeping the lights on was enough. Yet as times change, new needs arise. Our co-ops are always there to meet the challenges and strengthen the bond between community and cooperative. Today, our member-owned electric cooperatives are vital social and economic components of the communities we serve, providing much more than just keeping the lights on. As I’ve mentioned before, we can’t control every aspect of what goes into determining the price of electricity. Another large and important part of our “community” is the Tennessee Valley Authority. At one time, most of the electricity we use was generated by TVA’s hydro and coal plants. Over the years, the percentage of hydro power has diminished, nuclear power came on the scene and coal-fired generation has declined. It’s a daunting task for TVA to generate the power that our communities need at a cost we can afford. As energy prices have risen, we’ve emphasized energy efficiency and conservation. That’s a delicate balancing act as new ways of using electricity are introduced to our communities; think about the number of televisions, appliances and phones plugged in at your home. Our educational efforts also include safety, renewable energy solutions, economic investment and youth programs. Often, electric co-ops are among the largest taxpayers in the towns or counties we serve. Innovation adds challenges to operating our systems, but it’s nothing we can’t handle. As we’ve done over the course of our existence, we’ll adapt and meet the changes of our communities. As for those linemen from Community EC, they were joined in storm-ravaged areas by hundreds more from other states, including Tennessee. They were tired, and they needed rest. But while their co-ops back home were in good shape, there were others that were in need. Even though those that were in need were hundreds of miles away, they were never really out of the reach of the cooperative community. You never really are. NASHVILLE – As the massive Hurricane Sandy bears down on the Atlantic Seaboard, 60 lineworkers from Tennessee’s electric cooperatives are prepared to assist with power restoration once the storm subsides. Emergency work plans were put into place on Friday, Oct. 26, and crews from Tennessee headed for Virginia and Maryland beginning early on Saturday, Oct. 27. This cooperation is enabled through mutual aid agreements between electric cooperatives. Tennessee’s Mountain Electric Cooperative, Mountain City, is expecting more than 10 inches of snow to fall in its service area as a result of the hurricane. MEC abandoned plans to assist in Virginia and are now prepared to respond in the event of snow-related outages. The Tennessee Electric Cooperative Association is a trade association representing the interests of Tennessee’s 23 electric distribution cooperatives and the 1.1 million members they serve. Updates will be provided as additional details become available. Jim Allison, president and CEO of Duck River Electric Membership Corporation, has been named as a director for the Tennessee Regulatory Authority by Gov. Bill Haslam. A media release from Gov. Bill Haslam’s office is attached. NASHVILLE – The newly reconfigured Tennessee Regulatory Authority (TRA) has its first full-time executive director and two new part-time directors after Tennessee Gov. Bill Haslam’s reforms were passed during this year’s legislative session. Haslam worked with Lt. Gov. Ron Ramsey (R-Blountville) and House Speaker Beth Harwell (R-Nashville) on the joint appointments of business executive Earl Taylor as executive director and utility industry veteran James Allison as a director. The governor also appointed Herbert Hilliard, executive vice president and chief government relations officer of First Horizon National Corporation, as a TRA director. “It is our job to make state government as accountable and responsive as possible to Tennesseans,” Haslam said. “These appointees bring years of experience and expertise to the TRA. I am grateful for their willingness to serve our citizens and appreciate the lieutenant governor and house speaker for their efforts in this selection process. Passed during this year’s legislative session and signed into law by Haslam, HB 2385/SB 2247 changed the membership of the TRA from four full-time members to five part-time members and established the executive director position, the first of which was to be jointly appointed by the governor, lieutenant governor and house speaker. The TRA sets utility rates and service standards of privately-owned telephone, natural gas, electric and water utilities. Taylor practiced law in Johnson City for ten years and has an executive background as part owner of the CBS affiliate in Knoxville and as a business developer in Knoxville, the Tri-Cities area, Florida and Texas. He has a bachelor’s degree from the University of Tennessee, Knoxville and a J.D. from the University of Memphis. Taylor serves as a Metropolitan Knoxville Airport Authority commissioner, Knoxville Fellows Program mentor and as a Young Life of Knoxville committee member. Allison has utilities experience in Georgia, Kentucky, Tennessee and West Virginia, and is also regarded as one of the top instant replay officials in college football after having been an on-field official in the Southeastern Conference for more than 12 years. Hilliard has spent 42 years at First Horizon and is currently the board chair for the National Civil Rights Museum, a board member of Blue Cross/Blue Shield of Tennessee and a commissioner for the Memphis/Shelby County Airport Authority.